Every separate space in a home has a focal point. In a living room, it's often a fireplace, sofa or bookcase. In a bedroom, it can be an armoire, headboard or other piece of furniture. In the bathroom, the focal point is most often a bathroom vanity or a bathtub. While there are many different styles, colors and materials available for bathroom vanities, many people still feel that their options on creating a statement with a bathtub is limited to choosing a different shape or size of white tub. However, design experts say that basic white is no longer the norm when it comes to choosing a new bathtub. Colored bathtubs, as well as ones that are constructed of stainless steel and wood, can add a unique element to any bathroom renovation. 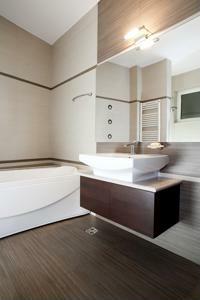 Freshome.com reports that a wooden bathtub - like the Laguna Basic Tub by Alegna - is an ideal addition to a contemporary bathroom. These items are not only stylish, but are durable and are expected to look beautiful in a space for years to come. They are available in different finishes to match any bathroom décor and are can also be upgraded with luxury extras like an integrated Jacuzzi. Those searching for an unusual element to help make their bathroom beautiful and stylish may consider purchasing a unique bathtub to make a statement.